A great addition to your tool collection is this set of mini-ratcheting spanners. I’ve been trying out this set from Proxxon with pleasing results. 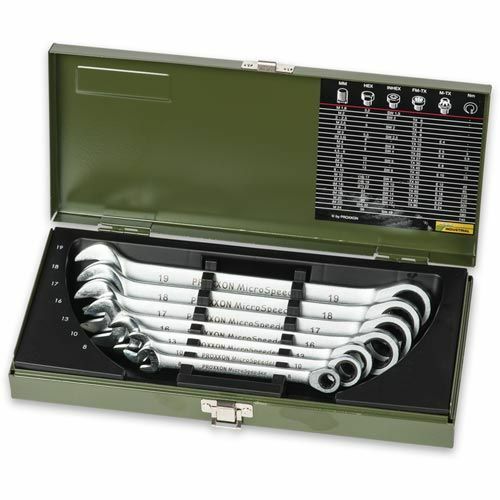 Seven spanners are included in the powdercoated dark green box ranging from 8mm-19mm. I like their feel in the hand and they have a steel shaft with durable nickel-plating and a matt finish. The set is priced at £53.96 inc VAT and to find your nearest Proxxon retailer call 03332 406 967 or visit brimarc.com ENDS. Print article This entry was posted by admin on May 12, 2017 at 9:08 am, and is filed under Uncategorized. Follow any responses to this post through RSS 2.0. Both comments and pings are currently closed.